Let me take this time to thank Irish Aid, ICOS & NUI Galway for giving me this opportunity to study Climate Change, Agriculture and Food Security. Thank you CSIR for the work experience you have provided me with during my Home Based Research and lastly Thank you God. 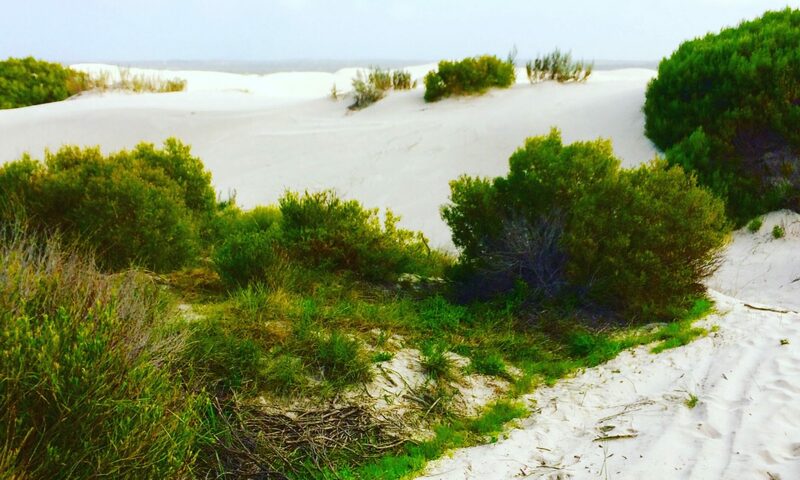 Is the Western Cape province exempted from planting more trees? In trying to keep global temperatures below 2 °C, the world needs to minimize carbon emissions mostly from the energy, transport and agricultural sectors and promote mitigation practices such as to increase plantations that can decrease carbon concentrations in the atmosphere (Rogelj et al., 2011). Planting more trees in South Africa especially in the Western Cape province might be a challenge since the province is still not water secured after the water crisis that was experienced recently. it has also been reported that approximately 10 million hectares of land in South Africa has been invaded by invasive alien species that consume up to 50 l/day of water (Dzikiti et al., 2013). Do you know what’s interesting about field work? 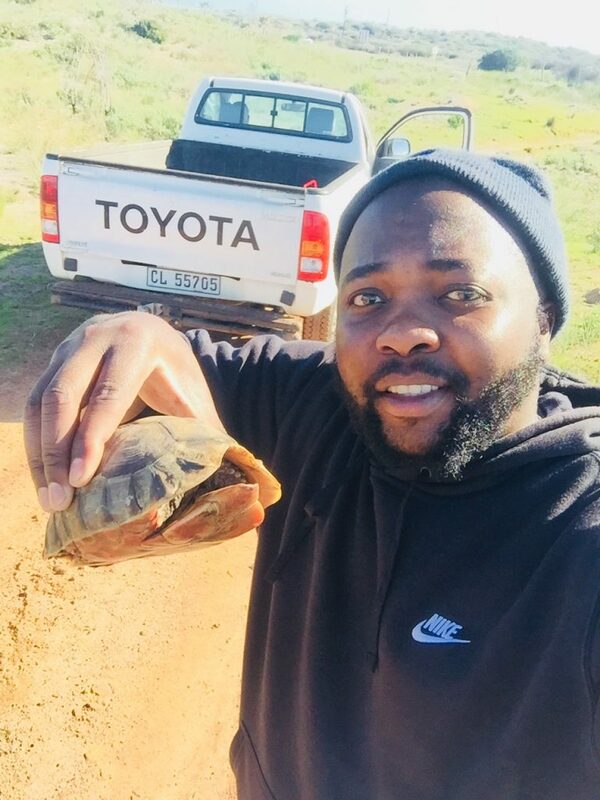 You get to meet other species such as the angulate tortoise which is endemic to Southern Africa. It has striking markings on its beautiful shell, which is used for protection and do you know what’s amazing? studies show they can live up to 32 years. Two parameters; stem diameter and tree height were measured at Atlantis on the 22nd of June and 27th of July 2018 in a field of Acacia saligna, and this was done to compare the growth of trees over a short period of time. 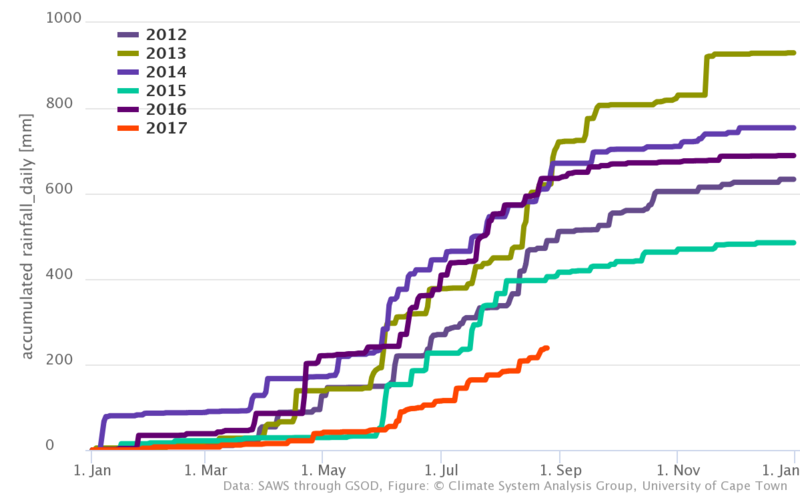 Based on the results it shows that the growth of the trees have increased slightly over a month’s period. The increase in growth was influenced by the climatic conditions in that area . NB: the trees were receiving enough rainfall during the month of June and July and they were exposed to enough sunlight to favor their growth. The major questions are how much will these invasive alien trees grow over a year and how much of groundwater will they utilize during summer when less rainfall is received in the Western Cape province? 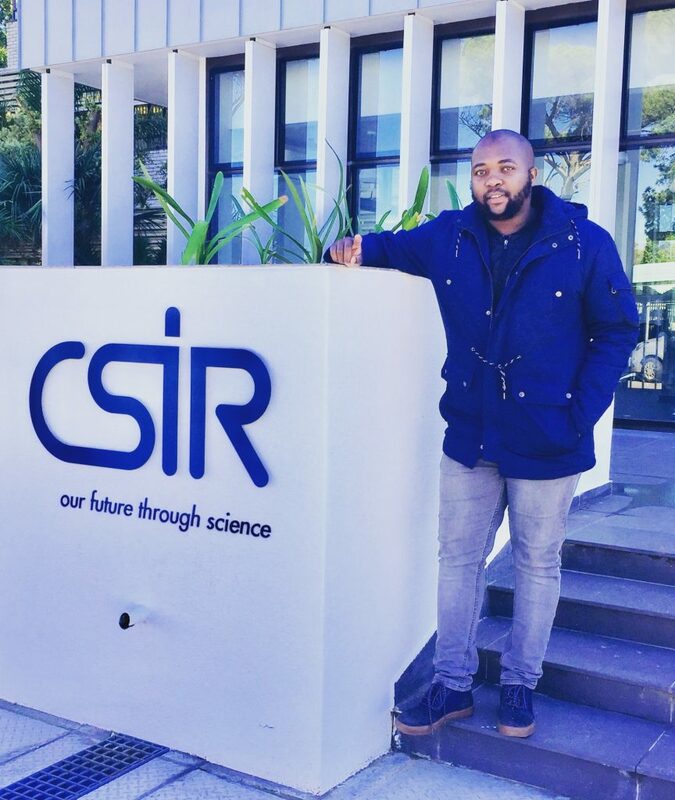 Thank you so much to CSIR for welcoming me to do my research, I have learnt a lot from Dr Mark Gush and Dr Richard Bugan . As the deadline approaches, it’s time to go back to Ireland and finish what I have started. it was a long long journey now its time to conclude my studies. A second HPV system was installed on another site at Atlantis. 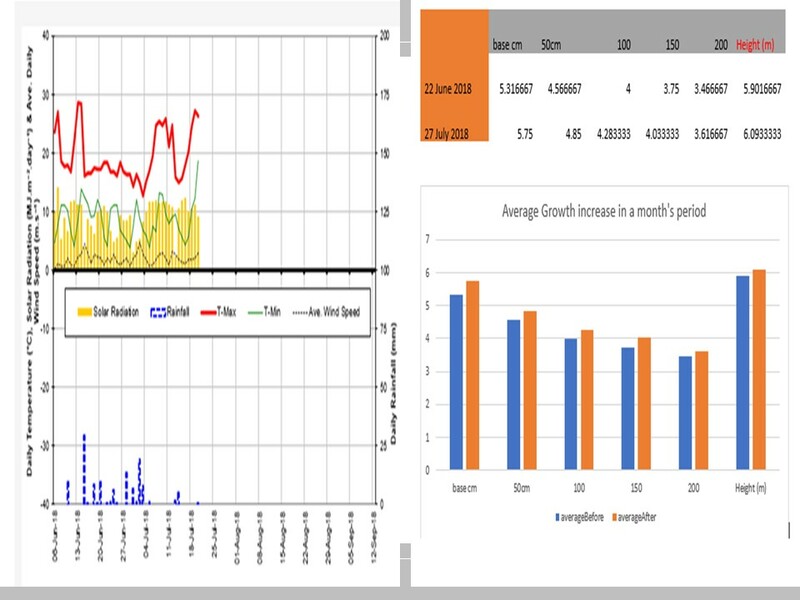 More insight on field work…. go to menu>>>Media>>>Atlantis field work . I’m continuing where I left of with data collection; today I managed to collect data for tree height and tree diameter under different classes. I also managed to download data from the HPV (Heat pulse velocity) to show how much moisture has evaporated through the trees and the AWS (automated weather station) that I will use to formulate graphs of rainfall patterns,humidity, daily temperatures and wind speed . To know the impacts invasive alien species have on groundwater recharge, I will have to check how much water has been depleted by the trees and how much they have grown in a period of two months. 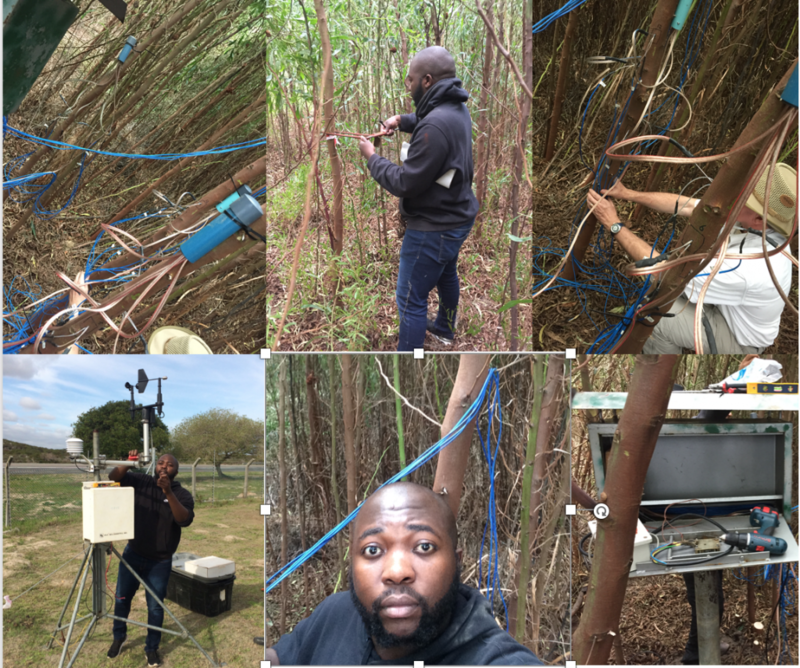 Today I took a field trip with my CSIR Host Supervisors to Conduct field experience in the installation of sap flow sensors to measure transpiration (water use) of trees. 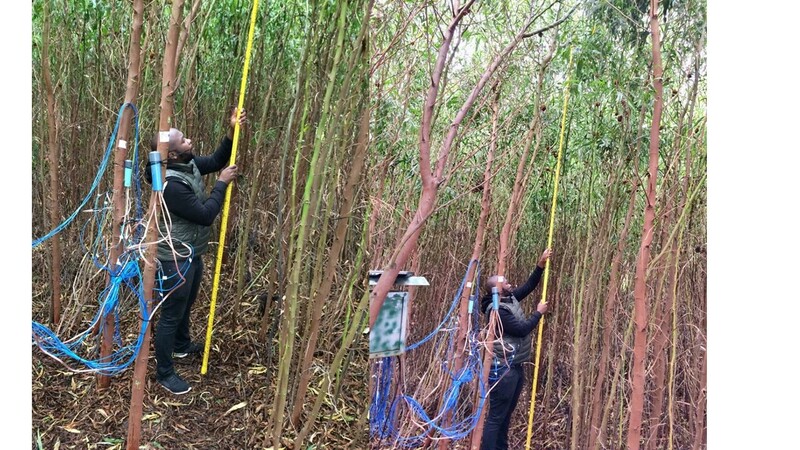 We also measured an area of 10m x 10m, Calculated how many invasive alien trees are found in that area and also measured their stem diameter. The reason for measuring the stem diameter is to check how much the invasive alien trees will grow starting from today (07/06/2018) and compare that data with the one that will be collected in a month’s time. It was a very informative experience today of drilling the trees at a certain length and inserting the sensors. Today I had a chance to learn how a Weather Station is installed. 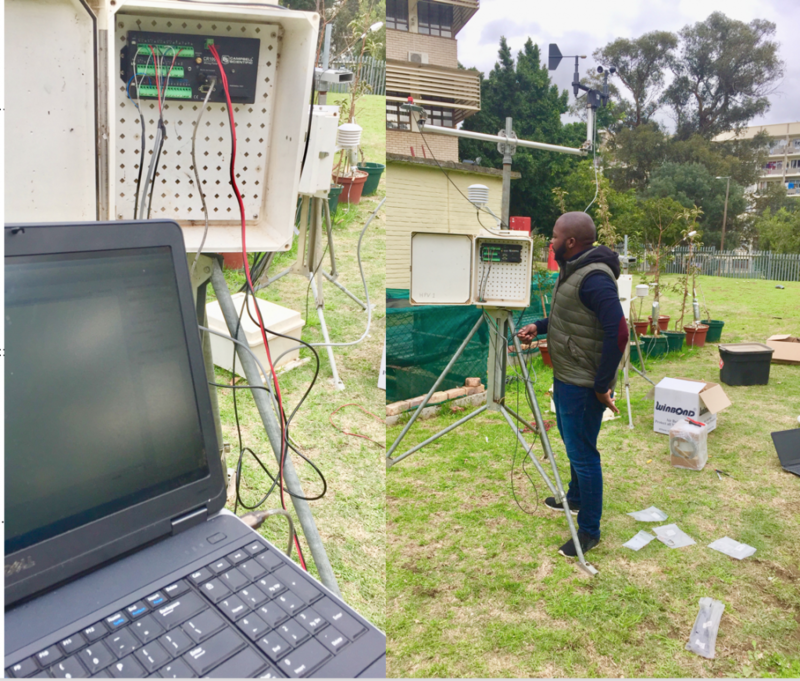 This Weather Station consist of sensors that are used to produce Data for wind speed, rainfall, humidity and daily temperatures that will be used to make proper arguments concerning the project at Atlantis, South Africa. All data received from the CR1000 logger is accumulated by connecting a PC. Why is it important to have a weather station?? 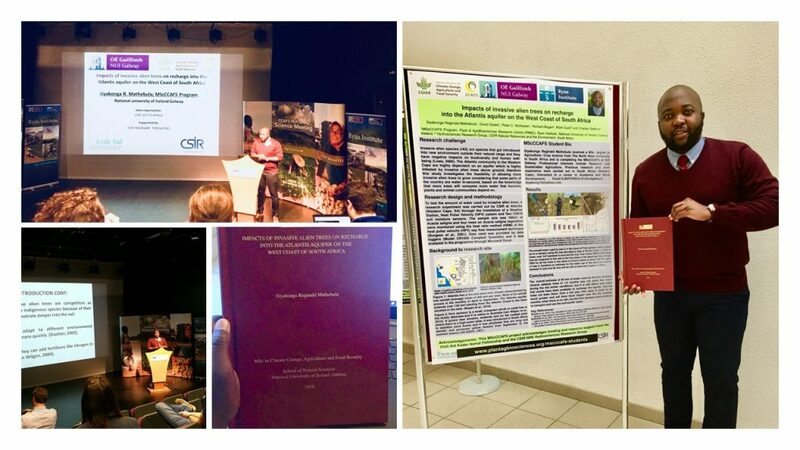 In order to understand the impacts of Alien invasive species on aquifers, we also have to know the climatic conditions of that area e.g how much rainfall has been received during the period of the research and how much of groundwater is being deducted by the invasive trees when temperatures are high etc .